Proper fitting of a pair of boots takes two important areas into consideration: length and width. When fitting a pair of boots, the space between the ends of the big toe of the boot should be the width of the thumb and there should be sufficient space under the lower edge of the tongue to admit an index finger in an unlaced boot. Improperly fitted boots can cause blisters, abrasions, calluses and corns; usually from boots being too small, thus causing friction or pressure. Over the past 100 years, our expert leaders have learned how to take care of our feet to ensure they never failed us, but even then, there are times when boots break down and do not protect the feet as they should. Since the military has hundreds of thousands of people, they buy boots that are common sizes that are designed to fit a large population. As we all know, this may not be the best solution for certain individuals if they have a unique foot shape or structure, which can become a major problem for the individual if the common sizes do not fit correctly. Although the military does not have a custom boot-fitting program, Soldiers can go to a military podiatrist for counsel and if deemed necessary, a prescription can be given to obtain custom fitted boots. For the most part, the majority of people will be able to wear the common sizes. 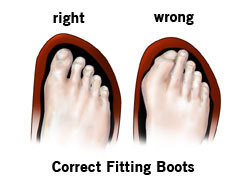 When determining the proper boot fit, there are several different areas that may be affected which may create discomfort. Major areas are heel, instep, and balls of the feet. If any of these areas are affected, each will provide indicators to why the boot does not properly fit. Follow the Rules of Thumb to assist with troubleshooting and determining the causes of friction of pressure. If the tops of the toes are involved, the cap is too low or too stiff. If the ends of the toes are affected, the boot is too short or too loosely laced. If the sides of the BIG and little toes becomes irritated, the boot is too narrow. If there is irritation at the heel, the boot may be too long, too loosely laced or have too wide a heel space for the foot. Heel – If your heel is loose, try tightening the laces in the area directly at the ankle-bend. Instep – If there is too much pressure over your instep (the top of your foot near your ankle), try completely skipping one set of eyelets with the laces, directly over the affected area. One drawback is that you may experience a looser heel fit with shoes laced this way. Wide Forefoot (ball) – People with WIDE feet (in a boot that is too narrow) often feel slight pain or numbness at the ball of the foot. To fix this, first try loosening the laces (in the affected area only). If this doesn’t work, you may need to try a thinner insole to give the feet more room. Also read about boot-freezing for Extra W-I-D-E feet. 1) Tighten up the laces. However, once the boots have stretch slightly, you may run out of room for more lace tightening which will require a thicker after-market insole to take out the excess space. Try a flat (arch-less) insole for this purpose and put it underneath the removable arch insole that came with the boot. 2) If your foot is causing heel slippage, use a Runner’s Knot. Pressure on the top of the toes – Boots that crease abnormally and dig into the tops of the toes are too wide, too long, or have too much interior volume for the feet. Thicker insoles may remedy this issue.